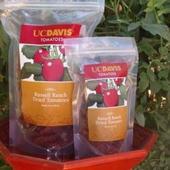 Russell Ranch Dried Tomatoes are available at the UC Davis bookstore. Adding to a growing list of campus-produced products, Russell Ranch has introduced a new UC Davis product -- Russell Ranch Dried Tomatoes. Russell Ranch Dried Tomatoes are grown at UC Davis' Russell Ranch Sustainable Agriculture Facility, a 300-acre farm west of campus. The organically grown tomatoes are part of a century-long study of agricultural sustainability at the ranch that compares the long-term effects of different ways of farming. Research at Russell Ranch focuses on soil and water quality, nutrient cycling, pests and profitability.